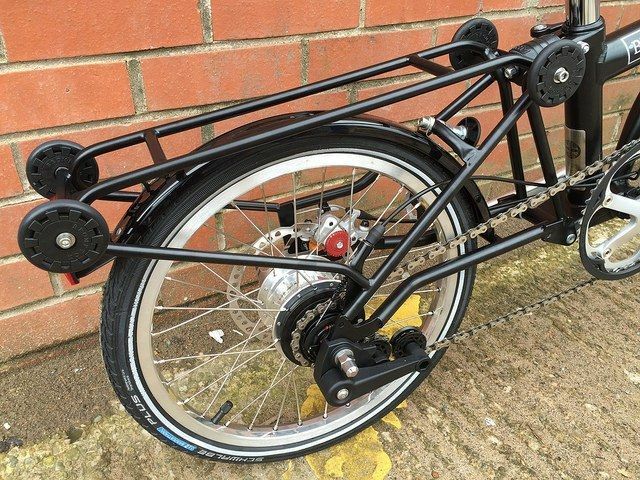 The kit includes a complete new rear wheel with black rim, black spokes, and black hub, a new chain tensioner, a new rear frame with integral rear rack, painted to match your bike, and all the necessary fittings. 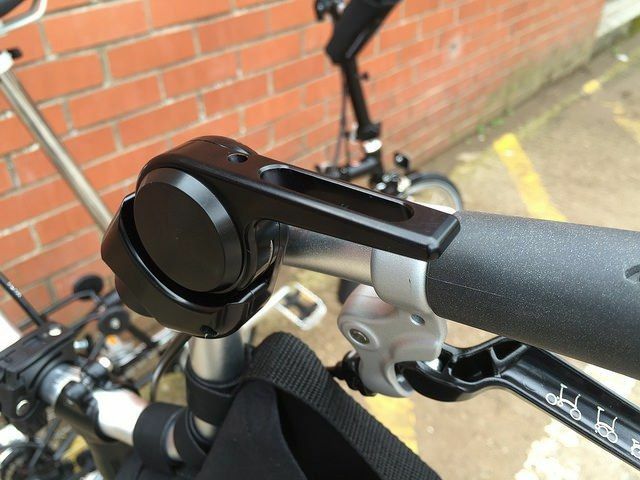 The shifter is a black J-Tek thumb shifter which is ideal for the M/H handlebars. 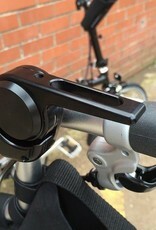 For S bars you will want the standard Alfine trigger shifter. Because this new rear frame is disc-ready, you can upgrade the brakes easily later – the hubs have a centrelock fitting to take a brake rotor. You can use a variety of disc brake options, including super powerful hydraulic systems. For gear ratios, a 50t chainset and 18t rear cog will provide a gear inch range of 24″ to 99″. 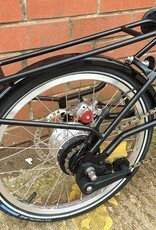 By comparison, the normal Brompton 3-speed has ratios from 44″ to 79″, and the BWR 6-speed has ratios from 33″ to 99″. Note: The rear cog has to be 18t, but the chainset can be 44t or 54t to move the ratios up or down. Since this is a custom painted product, please allow 3-4 weeks for delivery. You will need to add two links to your chain or replace the chain with one that is two links longer. Note that the images show a silver hub, spokes and rim, but the hub, spokes and rim you will receive are black.